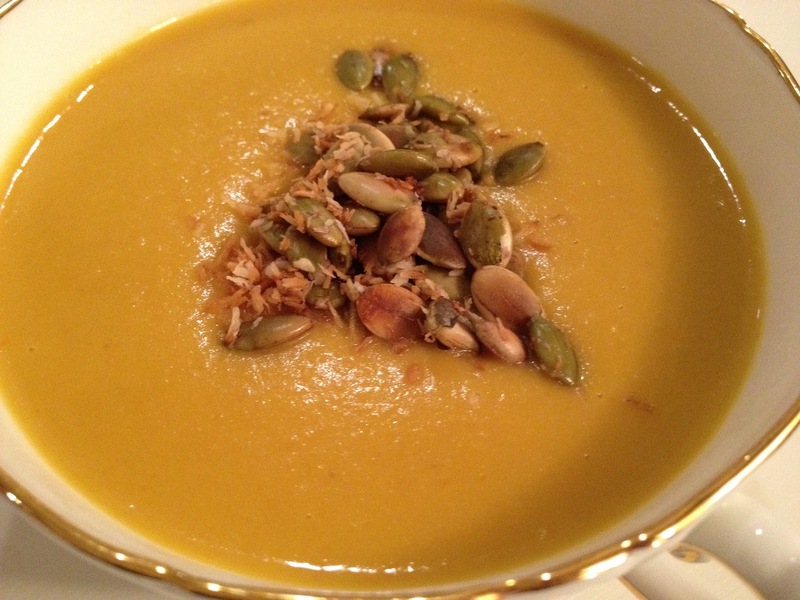 I still had pumpkin puree leftover from my Thanksgiving adventures so I made up this soup this morning. It was so good, my husband and I ate the entire pot ourselves. The toasted coconut and pumpkin seeds garnish is seriously amazing. Prep the vegetables: chip the onion, carrot and pepper. This soup will be pureed so no need to finely dice. Heat sunflower oil in soup pot. Add onions and sauté until translucent. Add the carrots and peppers. Cook for a few minutes. Add the pumpkin puree and cannellini beans. Cover with coconut milk and water and bring to a boil. Add the ground ginger, salt and pepper (to taste.) Cook on medium heat until vegetables are soft. Using an immersion blender, puree until completely smooth. Just before serving, toast the coconut and pumpkin seeds in non-stick skillet on the stovetop. Ladle into bowls and garnish with coconut and pumpkin seeds. Enjoy!